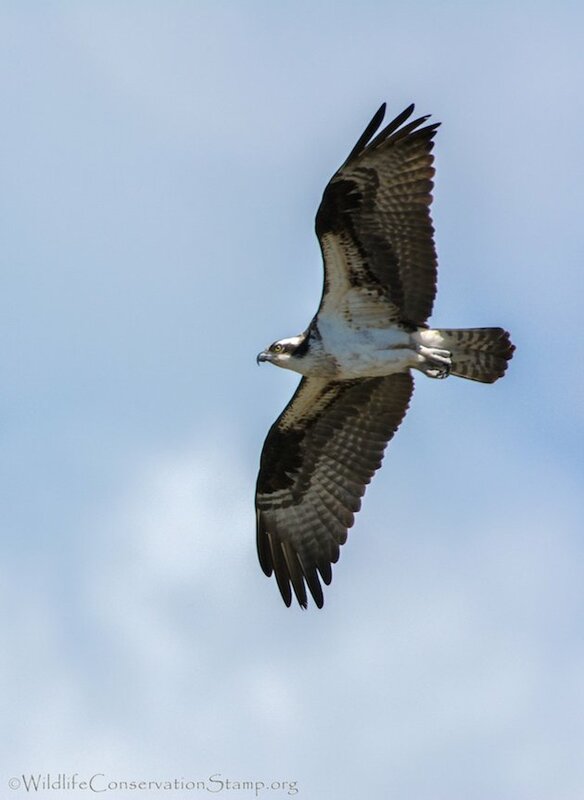 The Migratory Bird Treaty Act makes it unlawful at any time, by any means or in any manner, to pursue, hunt, take, capture, kill, attempt to take, capture, or kill, possess, offer for sale, sell, offer to barter, barter, offer to purchase, purchase, deliver for shipment, ship, export, import, cause to be shipped, exported, or imported, deliver for transportation, transport or cause to be transported, carry or cause to be carried, or receive for shipment, transportation, carriage, or export, any migratory bird, any part, nest, or egg of any such bird, or any product, whether or not manufactured, which consists, or is composed in whole or part, of any such bird or any part, nest, or egg thereof. 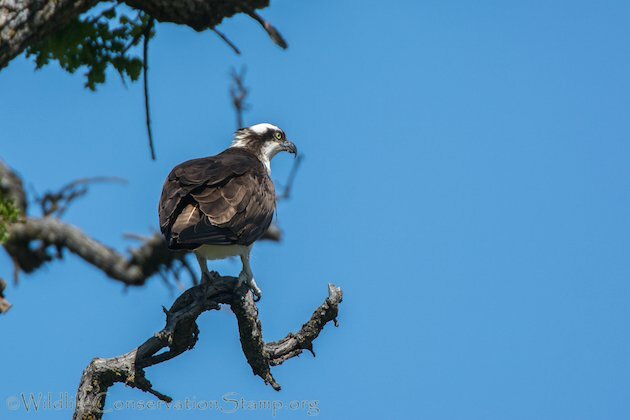 So when a local Osprey (Pandion haliaetus) nest that had been occupied for at least the last eleven years was removed by the local park and recreation department, after the Osprey pair had already arrived to nest, people were upset. 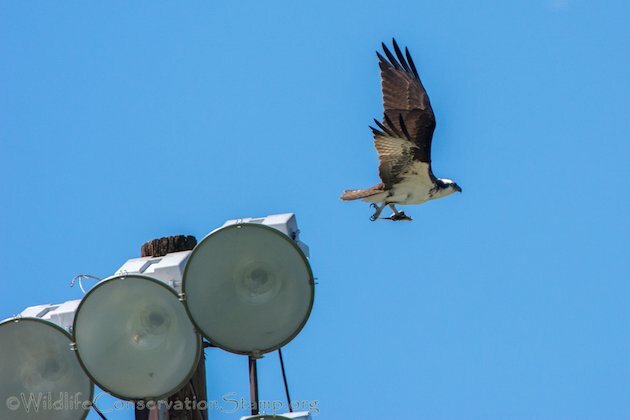 The nest was located on a soccer field light stand. This is a photo of the stand adjacent to the one in question. was now being laboriously reconstructed at great speed to begin this nesting season. The new nest is still but a ghost of what the old nest looked like. 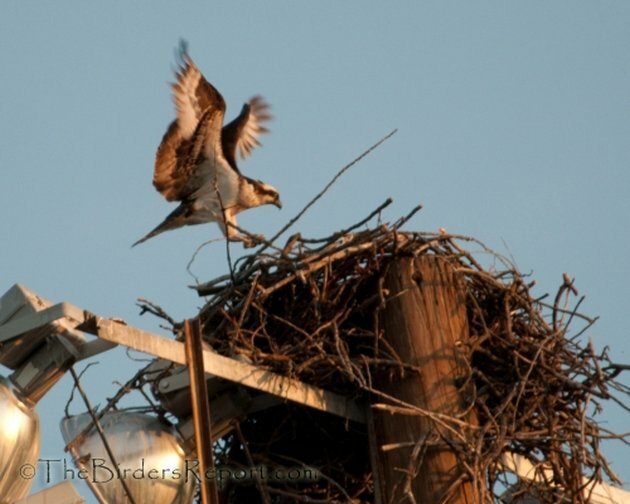 This is a poor photo I took of this pair’s nest back in 2009. 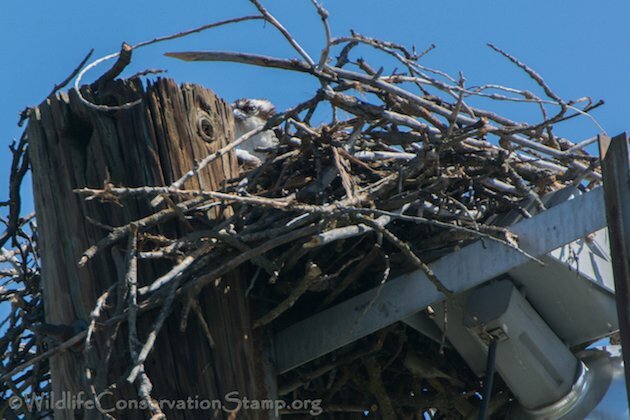 You can see that the nest came up above the top of the post and was wedged down in the framework between the lights. 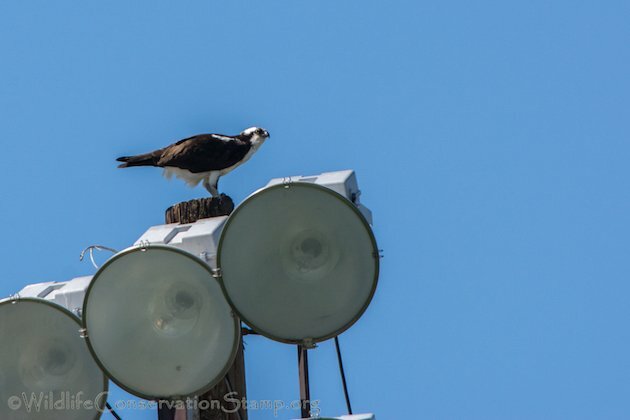 A letter requesting information on the permit issued to remove the nest got this response from the city, “In reference to your request for documentation for the removal of an active Osprey nest from the light pole at the soccer field, please be advised that none exist. 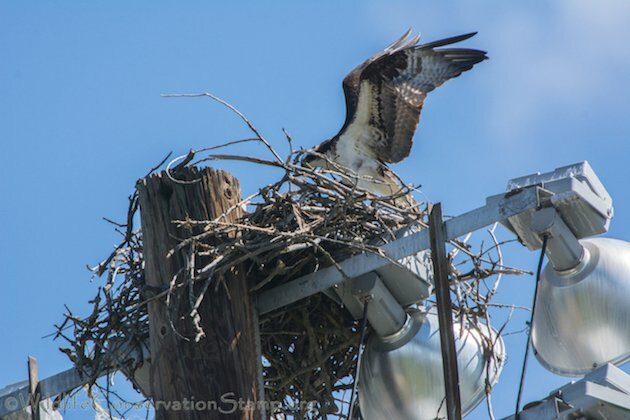 Does that look like a nest that would simply “fall” from the light pole? Obviously not. 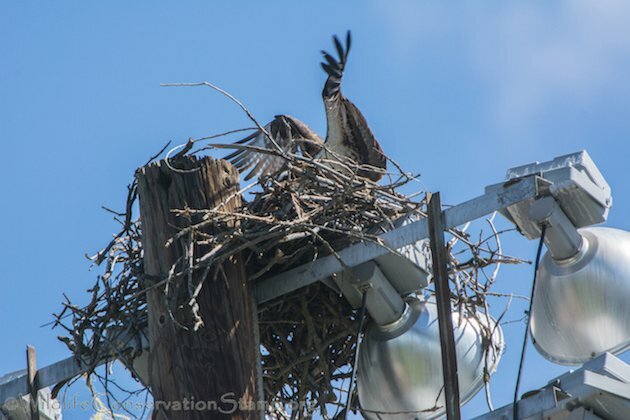 Osprey nests are a massive accumulation of sticks and debris, including various man-made materials, re-used and added to in successive years. They can be three to five feet across and from one to ten feet high! 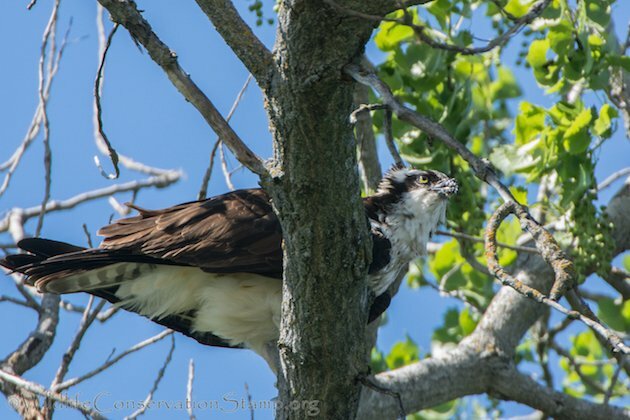 We are all watching intently as these two beautiful raptors attempt another successful breeding season without further disturbance. 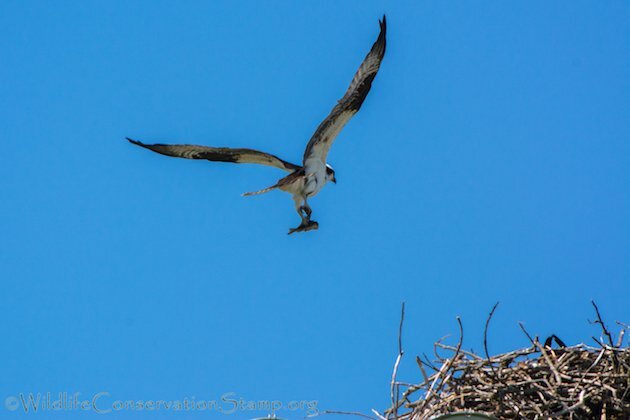 We have been assured by the California Department of Fish & Wildlife (CDFW) that they are watching this nest also. 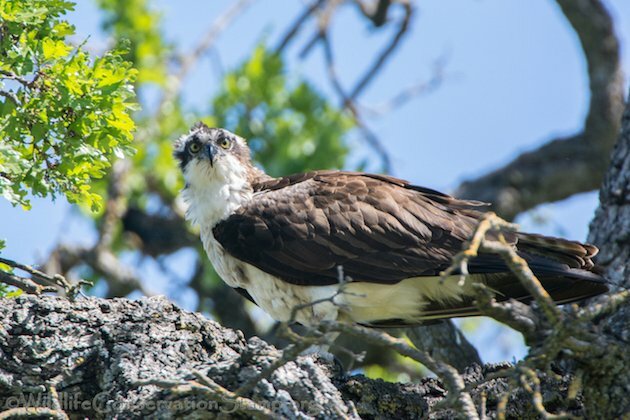 After all, we want to see this Osprey pair flying in every Spring to carry on their very successful display of breeding prowess without human interference. 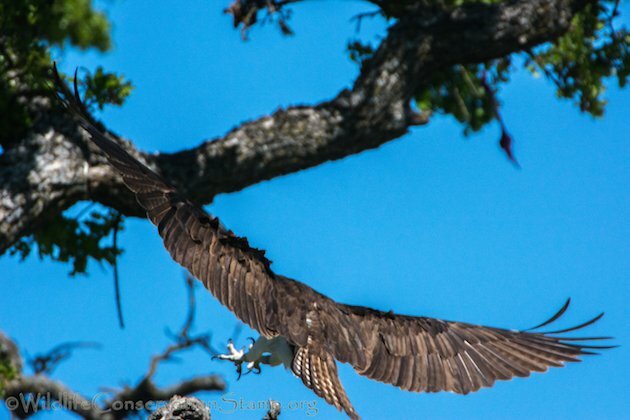 That is what the Migratory Bird Treaty Act is meant to do. I love that last photo. I hope they survive this season. 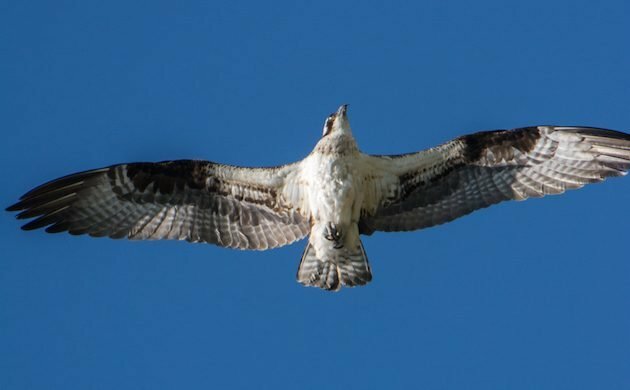 A few years ago I read a fascinating book about ospreys in Cape Cod– Return of the Osprey: A Season of Birds, Flight, and Wonder.